Gahri is a Tibeto-Burman (West Himalayish- Tibeto-Kinauri- Tibeto-Burman) language spoken in Keylong block of Lahaul and Spiti district of Himachal Pradesh. The language is spoken in the Gahr Valley along the Bhaga river from its confluence with Chandra river and upstream by approximately 3000 to 4000 people in Keylong (Upper and Lower) town and the nearby villages including Billing, Gyuskyar, Yurnad, Gumling, Katchra, Mongwan, Styingri, Tayule (Gompa), Gumrang, Sikkeling, Griemas, Bokar Gompa, Sasure Gompa, Gozang, Kardang , Kardang (Gompa), Barbog, Paspara, Namchia, Lepchang, Chhelling, Pyaso, Mangmore (single home) and Pyukar. In the available academic materials the alternate names of the Gahri language are Lahauli of Bunan, Bunan, Punan and Keylong Boli with different spellings. In the UNESCO list of endangered languages Gahri is mentioned as the alternate name of the Bunan (bfu) as ‘definitely endangered’ on the scale of vitality. 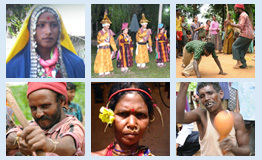 The documentation of Gahri language has been undertaken by the SPPEL and a pilot survey has been conducted. During pilot survey approximately 500 words and 200 sentences has been recorded. The transcription of the collected data and slicing has already been completed. The work on language analysis for writing grammar and work on digital dictionary along with sound and pictures are in progress.